Ambiente Blog • Veni, vidi, vino! In the words of Goethe, Frankfurt’s most famous son: ‘If you to drink are pressed, only drink of wine the best’. He obviously appreciated fine wine – as do many modern-day residents of Frankfurt. We visited a variety of excellent Frankfurt wine merchant and wanted to share our experiences with you. In Frankfurt, people like to eat and drink – and they know a good wine. Indeed, this city is one of very few in Germany with its own vineyard inside the city limits. It’s known as the metropolis on the Main, but it might also be called ‘the metropolis of wine’. 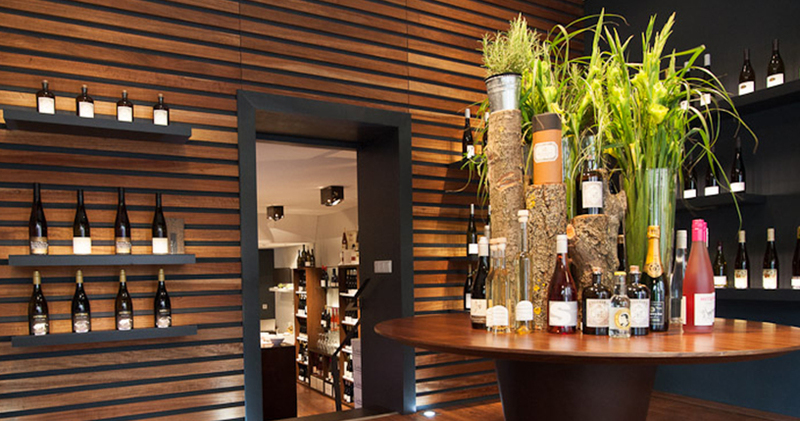 We sampled an excellent range of Frankfurt wine shops, and wanted to share our tasting notes. We started off at ‘Frankfurt/Wein’ in Wittelsbacherallee, and soon saw there was a clear line to be drawn. There was the clean, purist design of the bar’s interior, and there was also the exclusive focus on German wines. 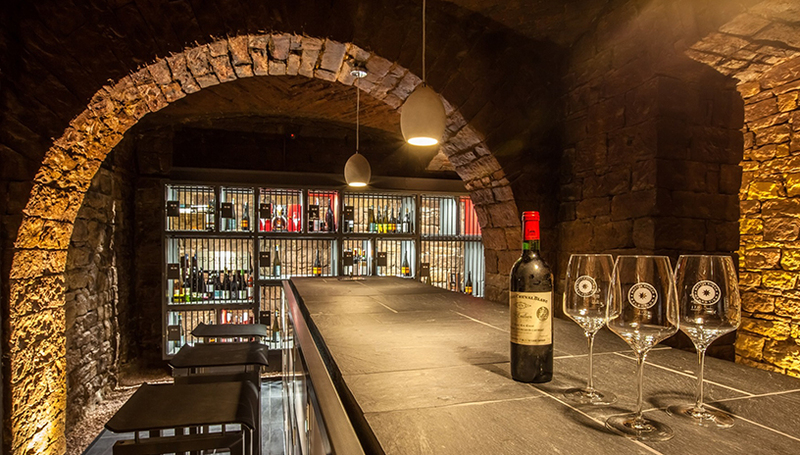 The many bottles of wine on offer are lit through frosted glass, inviting you to take a sip. Wine merchant Gernot Dorsch explains he had a choice between offering a bit of everything or concentrating on a niche. In fact, his particular niche has been highly fashionable for several years now. He explains that the neighbouring European countries are crazy about German wines. German customers now also request particular regional wines. We could have listened for hours as Gernot explained what Donald Trump’s election victory means for the international wine trade, or why sweet wines sadly still have a bad reputation. His enthusiasm is infectious. 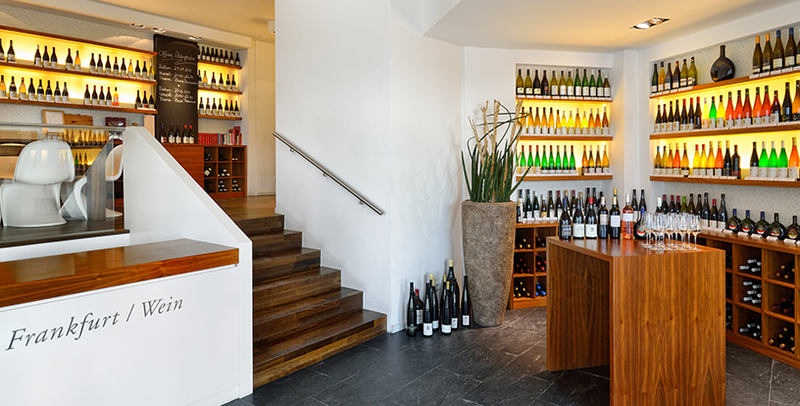 It’s no wonder that Frankfurt/Wein was recently voted the second-best wine shop in Germany. Just a couple of minutes’ walk away, we found the ‘Weinhalle am Merianplatz’, an owner-operated wine shop established some 20 years ago. Once again, there’s tangible excitement here about the continuous improvement in local wine growing areas, even though most wines in the shop are from surrounding European countries. We try an excellent Italian red, before browsing the high walls of wine bottles. The wooden crates, industrial lamps and large chandelier on the ceiling create a great atmosphere. Thomas Schlepütz, one of the owners, explains that customers almost always ask what his favourite wine is. But although he admits to preferring certain grape varieties, his passion and curiosity make it impossible for him to select just one wine. Having toured France, Spain and Austria we move on – taking a bottle of the Italian red with us. A short way down the road, there’s a stylishly decorated shop window where you just have to stop and stare. The ‘Westlage’ wine shop has been based here, in a former bakery, for five years now. Its opulent window display is a throwback to the good old days. Inside the shop, the tasteful decor continues and with its candles, modern wall panels and wood furniture against anthracite walls, almost threatens to distract us from the main event. But we’re here for the wine, which comes exclusively from the Pfalz region, like the owner Andreas Georg Dresch. He’s known his wine growers for a long time, indeed the growers he first got to know in the Pfalz have now handed over to the next generation. So the wines he stocks are young and original, just like their growers. Finally, we ended up in the city centre for a visit to the ‘wineBANK’: an absolute must in a banking centre such as Frankfurt. Carlos Schönig and Jean-Pierre Berlejung brought the idea for a private members’ club for wine lovers from Rheingau to Frankfurt. Private individuals can store their wines here for a fee, and use a chip card to call in with friends whenever they like. We’re especially interested in the vinotheque on the ground floor, which looks like a comfortable modern dining room. When we call in, a friendly crowd are already sitting round one of the tables enjoying a bottle of white wine. A clever system allows wineBANK customers to taste old, rare and correspondingly expensive wines by the glass. An ingenious dispensing system leaves the remaining wine in the bottle, well preserved for another day.